The past year has been an interesting yet turbulent time at interdealer broker Tradition. The company has gained significant support from a variety of banking institutions and spot FX market participants for its new ParFX venture, which went live last week. Founder testing was completed relatively quickly and the accrual of bank support gained momentum leading to ParFX being launched on schedule. Despite banks continuing to show interest in supporting new platforms, Tradition as a corporate entity has not performed well financially in recent times. 2012 was a weak year for the company, and its start to 2013 resulted in a decrease over the same period one year previous. The company predicts that the consolidated Non-IFRS revenue in April 2013 is up by more than 14% at constant exchange rates compared with the same month last year based on internal projections. With the implementation of the new International Financial Reporting Standard (IFRS) for accounting on January 1, 2013, the revenue figures are further affected. The consolidated accounts of Company Financière Tradition Group are prepared in accordance with International Financial Reporting Standards (IFRS). Until 2012, companies over which the Group exercised joint control with other partners were consolidated using the proportionate consolidation method. Compagnie Financière Tradition SA’s equity holding in each of these jointly controlled entities was recognized on a line-by-line basis in the consolidated balance sheet and income statement. This essentially concerned the currency options business operated jointly with ICAP and Volbroker, and the forex trading business for retail investors in Japan operated by Gaitame. Following the Group’s adoption of IFRS 11 – Joint Arrangements from January 1 2013, the proportionate consolidation method has been replaced by the equity method. This transition will affect almost all line items in the financial statements, notably by decreasing consolidated revenue and expenses, assets and liabilities, but will not impact the net profit for the period and shareholders’ equity. The presentation change also required the restatement of financial information for the previous financial year. However, the Group is retaining the proportionate consolidation method for consolidating these companies in its management reports (“Non-IFRS”), since this allows a more precise assessment of the Group’s economic performance and key indicators. This presentation method is used in the publication of segment information, disclosed in the notes to the interim and annual accounts. In this context, the Group is reporting below its revenue on an IFRS and Non-IFRS basis. 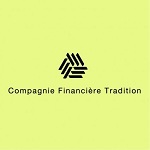 Compagnie Financière Tradition reported first-quarter consolidated IFRS revenue of CHF 235.3m, compared with CHF 265.3m in same period in 2012, a decline of 11.3% at current exchange rates or 10.6% in constant currencies. For the same period, the Group’s consolidated Non-IFRS revenue was CHF 252.6m, compared with CHF 282.9m in 2012, a decline of 9.7% at constant exchange rates. The Non-IFRS revenue from interdealer broking business (IDB) was down 10.2% in constant currencies while the forex trading business for retail investors in Japan (Non-IDB) was up 8.4%. However, trading volumes were higher than in the second half of 2012, with Non-IFRS consolidated revenue up 15% at constant exchange rates. 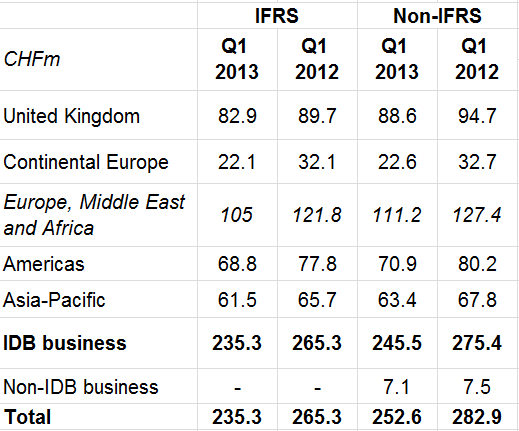 The IFRS revenue from IDB business rose 14% while that from Non-IDB business was up by 60%. Finally, the full effects of the cost saving measures implemented in 2012 have been felt since the beginning of 2013.